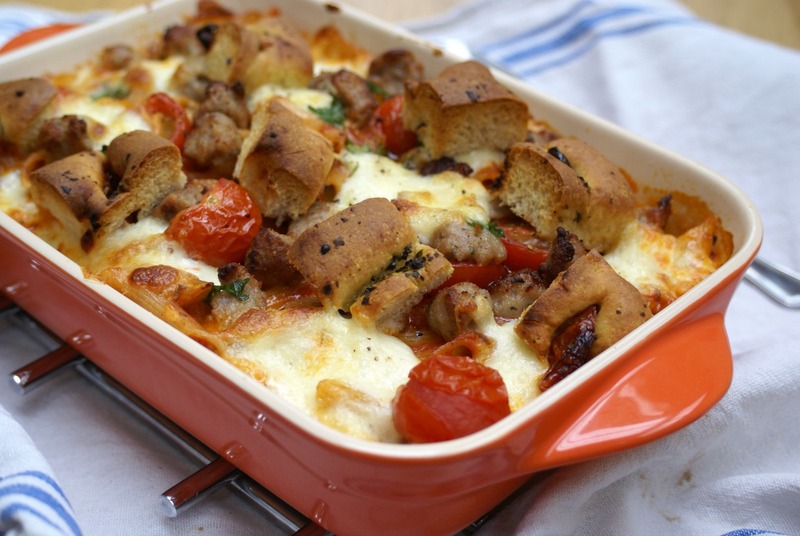 Baked sausage penne topped with focaccia croutons. Some of you may have seen something similar to this in M&S’s new season range. My Mum brought one home to try last week and I couldn’t believe she’d paid so much for something so simple. Not to mention the complete lack of sausage and dry, sauceless pasta. “I could do better”, I said. So I did. This is a great way to jazz up a jar of store-bought pasta sauce or home-made for that matter. It turns plain pasta in to something Matt begs for seconds and thirds of. I really do get sheer joy out of watching people enjoy the food I’ve made, especially him. Yes, a bit of a mushy moment but with my Parent’s away I’m really appreciating the amount he does for me. I feel lucky. Whilst I’m off on a tangent, I was so happy with the photo above (completely unedited) until I noticed the burn mark on the tea towel! That will teach me to start using oven gloves. It’s really niggled me but I refuse to edit it out. Perfectly imperfect? Despite the little niggle, I hope my photos get your taste buds going a little, I’m really working on improving my skills at the moment. This recipe comes in at £4.65 (around £1.16/person) using mid range products or £2.48 using value range items at Tesco (62p/person). Preheat the oven to 180 degrees Celcius. Part cook your pasta so that it's softened but still has bite. Whilst that's going, remove the skin from your sausages and crumble the meat in to a frying pan, just to brown it. Drain the pasta and stir your sauce through along with the chopped tomatoes, sausage and anything else in your fridge that you fancy. Add to an ovenproof dish and top with chopped parsley, mozzarella and the focaccia. Bake for 15mins or until the cheese has melted and has started to turn golden. Spoon out that delicious sausage penne. Argue over who gets the last crouton. P.S. I’m sorry there aren’t more photos. We were both just so hungry! Wow, this looks AMAZING. Thanks for sharing. Oh my goodness, this looks so delicious! I often found myself thinking that I could do better than ready meals, even the ones from M&S, so I just don’t buy them any more if I can avoid it. I do like the My Goodness range from Sainsburys though, quite tasty and relatively healthy. Wow this looks so so good! Will have to give it ago! I need to stop reading your blog, it’s making me so hungry!! This looks great! Would never have thought to put focaccia on top as croutons but will definitely be trying it now! So easy & sooooo delicious. Thanks for recipe.